FIRST Movement Therapy Class with Coach Jess is SUDNAY 11am- 12pm. This Sunday is a our first of our New Specialty Class. From now on it will be held the LAST TWO Sundays of each month. This class is called Movement Therapy because it is made and structure to assist movement of a specific zone of the body. This week is Thoracic Spine (mid back... aka the part you really hunch when looking at your phone and computer) and Shoulders. So if you have problems going overhead with weight , getting in front rack position, hanging for the bar, or have been ignoring an old injury from way back when, this class is for you. Jess will take her expertise as a Physical Therapist and apply them in a class model and send you home with tools to increase range of motion and stability in specified areas. FIRST Movement Therapy Class with Coach Jess. 11am- 12pm. Jess will take all her expertise and apply them in a class model and send you home with tools to increase range of motion and stability in specified areas. Vickery is having our Annual St Paddy’s House Party on Greenville. All our welcome. ALL CLASSES ARE CANCELLED SATURDAY. SATURDAY CLASSES ARE CANCELLED. SEE YOU AT ST PADDYS PARTY! Sunday Skills this week is going over the double under and how to practice them. If you do not have double unders… you need to go. Waiting for after Open Announcement to program this Day. Seriously, if you don't have double unders... go. If you didn’t know. Vickery is having our Annual St Paddy’s House Party on Greenville. All our welcome. 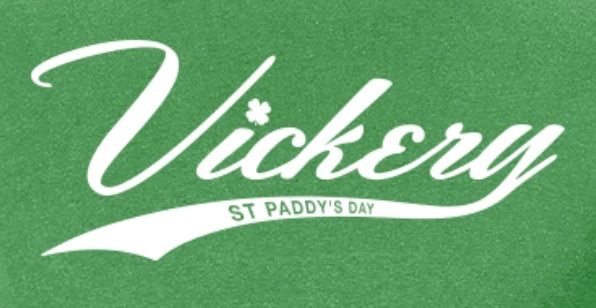 St Paddy’s Day Vickery T-Shirts! The Deadline for pre-ordering is THIS THURSDAY FEB 28th! They are $25.00 each and ordered via our “The Store” on Vickeryathletics.com.